The Early Learning Link is a themed curriculum specifically crafted for child care providers participating in the Child & Adult Care Food Program (CACFP). It is designed to enhance the child’s excitement for learning through hands-on experience. It offers lesson plans in four subjects: Language, Art, Math and Science. The lesson plans provide all the handouts, recipes, poems and song lyrics (if applicable) you will need. Each lesson plan is user-friendly and can be customized by the provider according to the needs of their children. 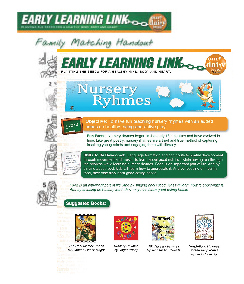 The Early Learning Link is 100% free to Our Daily Bread CACFP sponsored child care sites. A sample of the curriculum is available to the right. To access the full curriculum, click the button bellow. This button will take you to our ‘Providers Portal’, which will require a password for access. If you do not know your password, please call our office (865.938.6328) and we will issue you one. More lessons plans are available on our Providers' Portal.